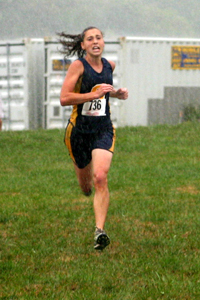 Abby Spitler has won small races before. She has even outrun opponents that she was not supposed to beat. But she had never found herself in the position she was in at the two mile mark of the Peter Geraghty Invitational varsity race. With two miles down and one mile to go in a torrential downpour, Spitler was right on the heels of Britt Eckerstrom and Megan Fitzpatrick, two of the best runners in the area. She could sense that she had the most energy of the three. She took a chance and took over the lead. And such was the defining moment in this breakout race for Spitler. With the wind in her face, she moved past the two returning All-Met runners and opened a gap until she was running all alone. It was clear that under these conditions on this day, she would be the strongest runner. Spitler finished first in 19:42.18. Eckerstrom finished in second place in 19:54.99, and Fitzpatrick finished third in 19:58.97. The Gaithersburg junior still has a long season ahead of her, but this gutsy performance makes a statement: expect her to be a contender this year. She opted to run indoor track over basketball in her sophomore year, and now after her first full year of continuous running and a strong summer of base training, "The money's in the bank," as Coach Tolbert would say. Bishop O'Connell High School put six girls in the top twenty to defeat second place Northwest 52-63. Most impressively, they did it with only two members from last year's top seven that dominated the WCAC and VIS. They have reloaded with new talent and the younger runners from last year have obviously stepped up to continue the team's tradition of success. Gaithersburg's Vikas Bhatia and Antonio Palmer boldly ran out front for two thirds of the race. Leading the pack into the strong wind took its toll on the two runners who were passed by Robert Patterson of DeMatha and Bill Ledder of Gonzaga with a mile to go. Patterson knew he didn't want to let the race come down to a sprint finish. He was familiar with Ledder's crazy kick at the end of races. So with about a half mile to go, he began pressing the pace. Just prior to re-entering the athletic fields for the final quarter mile, Ledder slipped and fell. He got up and kept running, but lost valuable seconds on Patterson. Patterson continued to press the pace, knowing full well that Ledder could still come from behind, but he was able to open up an insurmountable lead. Patterson won in a time of 17:07.10. Ledder was second in 17:16.43, and Bhatia finished third in 17:31.67. Patterson has now been the top WCAC finisher in his first two races. 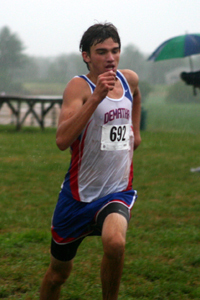 Defending conference champion Cory Puffett, also from DeMatha, chose not to run this race due to a mild injury combined with treacherous course conditions. Gonzaga defeated the public school favorites from Northwest in the team battle. They packed three runners in front of Northwest's number one runner. Gonzaga's top WCAC competition Good Counsel finished third in the team standings with almost twice as many points.